I arrived at the Meadowlands Fair at about 7:00 with two of my cousins; the admission was $6.00 which wasn’t too bad. Upon entering you are absolutely bombarded by people wanting to take your picture in hope that you buy the picture later and people that want you to sign a form to sign up for (something) and get a (whatever item) upon completion of the form. I used my “walk by” technique because 1, I had a digital camera fully capable of taking pictures, and 2, I do not need a new credit card or car. 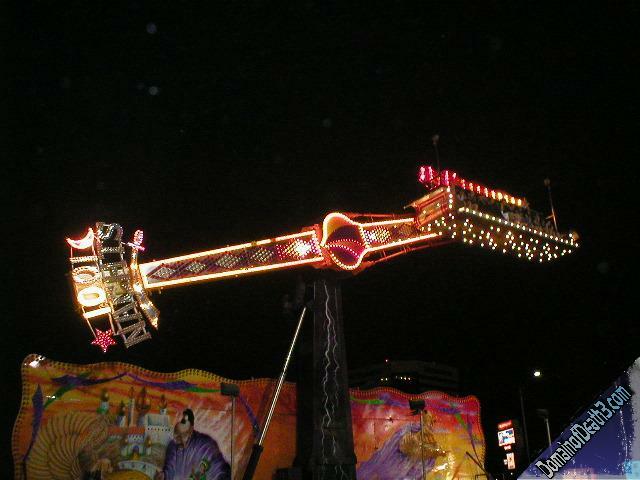 The first real ride was 1001 Nachts, a cut-rate Rainbow type ride. Rainbow, another ride that has been MIA these past years, is much higher and more comfortable than this skimpy looking version. A bit slow, not much air, and harnesses, I’ll take Rainbow any day over this! Next was the Ferris Wheel , which was fairly tall for a carnival. It had nice gondola seats and was actually pretty swift. Next was an old, bumpy, swinging car Himalaya . It’s like a filler ride really, not too intense and never has a line. The ride was pretty long and went forwards and backwards. Our fourth ride was the always fun Crazy Mouse spinning wild mouse coaster; there was a slight line but nothing to cry about. This one takes your picture during the dip just before the midcourse brakes; we all looked terrible in the photo of course. 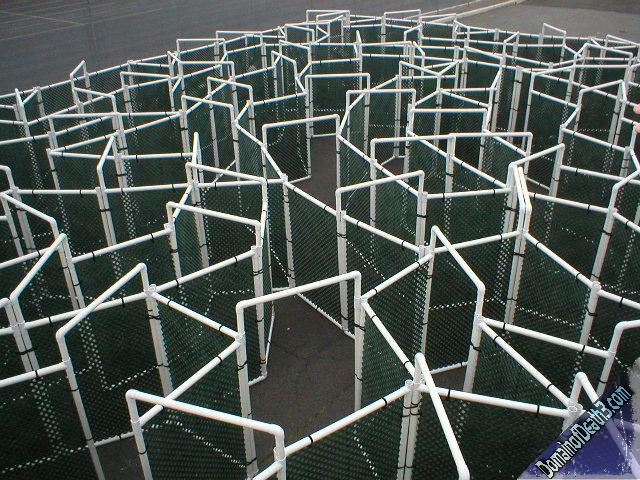 Next we checked out this huge, 10,000 foot maze which you actually had to pay to go in and get lost in. We quickly decided that $10.00 bucks (!!!) was way too steep for the pleasure of loosing your mind. The Cliffhanger was our next ride. Cliffhanger is a lay down paratrooper which is a lot of fun when only run for like 2 minutes. The ride op instead ran it for like 5 minutes and we all came off a bit nauseous. Normally this wouldn’t bother me, but for some reason my stomach was a bit jumpy all day. 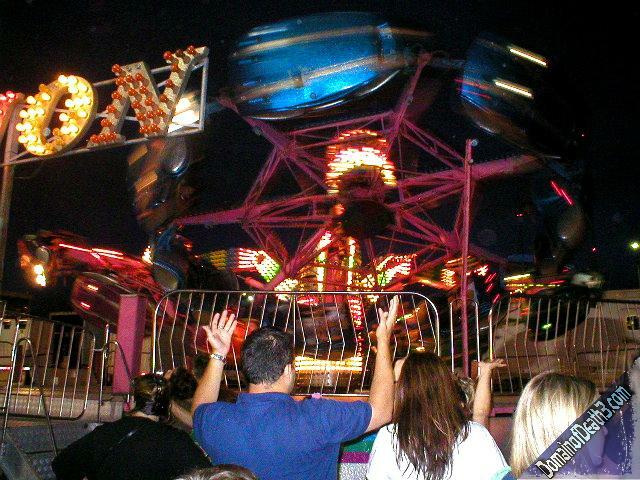 Or maybe it’s because my tolerance for spinning rides is slowly going down. Next we went to the little petting zoo the fair had set up. Normally I wouldn’t care to stop here but I definitely needed a break from the rides. The petting zoo had many sheep, miniature horses, llamas, a camel, and some other animals. Now I felt ready to tackle some more rides, we walked down the center of the carnival midway and went on an old Trabant ride called “Rave-Up .” This was pretty badly operated I must say; first the ride op told us to sit in every other seat and the ride op reprimanded me for sitting in front of a large inflatable alien…I didn’t really consider the seat with the alien as being occupied seeing as it weighed only a few ounces and wouldn’t throw off the balance. It must have been the guy’s friend. Anyway, the wheel didn’t spin very fast and we barely moved around the platform. Then the ride op just let the wheel spin, and then made the wheel spin at the same speed as the lift arm and we just waved up and down in one place. First the entire ride spun at a fairly slow speed with the wheels stopped; during the first revolution the music stopped and another song blasted on while we were next to the big speaker…perfect timing. Finally the wheels started to spin and became so fast that the cars were almost completely sideways. At this point the arms rose up so the wheels were at an angle and the G forces became intense with a capital ‘ I. ’ There was NO chance of us raising the bar, you could NOT move your legs and raising your arms was extremely hard. After like 30 seconds it was done and the wheels spun down quickly leaving me with that “still spinning” feeling for a few seconds. After a short time sitting down, we got in line for the Zipper . 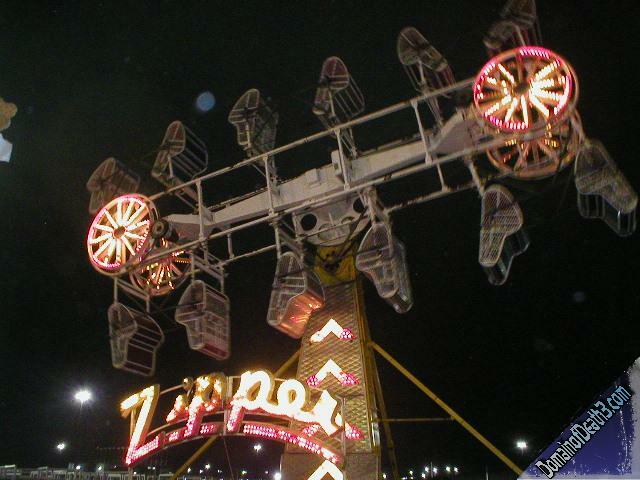 Now, this Zipper had all the center lights stripped off of it, and if you read my Zipper review I noted that the only way to make one of these rides look more like a torture device, is to strip off all the lights. I then noted that some carnival probably did this, and I was right! But who cares, it’s still the Zipper! This gave a very long ride and like almost all Zippers, the ride op only loaded 4 cars a ride. I noted that this Zipper had trouble moving the cars around the track; it is a tire drive so maybe the tires need to be replaced. Once it started going it was fine though. Next we went to see a cheesy magician show and a moderately cool tiger and lion show. Then it was back to the ride midway to ride the Fabbri made Bonsai, a floorless Kamikaze type ride. Again the ride op only allowed 4 sets of seats to be taken up, no clue why. The harness was a little loose on this and when upsidedown I must have come about 2 or 3 inches off the seat, which was fun for some reason. Next we were going to go on the Avalanche coaster but the line was very long because they would only let one car go around the track at a time. Instead we went on Ring-of-Fire, aka Ring-of-Rust. This Larson Ring-of-Fire was repainted black, and actually looked nice but it’s still the same ride. 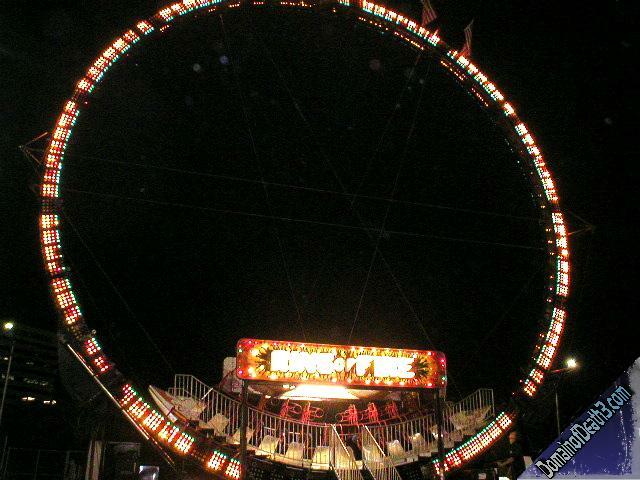 I had never been on an old Ring-of-Fire before (only the newer Fireball with open air cars and harnesses.) Everyone that I have talked to that has been on RoF says that it is horrible, and well…it is. First you need to cram yourself into this tiny seat with other passengers only a few inches in front of and behind you. I swear, I have never seen such a small area. I made a comment that the seats should come up all the way to the top of the car, that way you would be this tiny foot and a half front to back by 3 foot side to side enclosed area. The large padded safety bar closes downward, the padded bar is held in place by two steel bars which are no more than 3 inches from your face. The ride started and during the last swing before a completed loop, some persons pants button hit me in the face. So I held it in my hand, and after a few seconds decided to launch it from the ride. This proved to be my last ride as I didn’t feel to well after it. We finally got some overpriced milkshakes and left. The drive home from my relative’s house was great with barely any cars being about 12:40AM. Some highway expanses of I-78 were so desolate that I would just see black in front of me and black in my rear view mirror…just the way I like it.